The patient's undersized and worn anterior teeth were carefully built up using highly esthetic resin bonding technique, layered to mimic the translucency and opacity of a natural tooth. The patinent was thrilled with the visually pleasing and functionally sound result. The patient's right lateral incisor was congenitally missing (it never developed). It was restored using an oseointegrated dental implant supported all ceramic crown. The patient's left lateral incisor was congenitally undersized and was built up using highly esthetic resin bonding technique, layered to mimic the translucency and opacity of a natural tooth. The patinent was thrilled with the visually pleasing and functionally sound result. Invisalign orthodontic treatment was used to close this patient's large midline diastema (space). Whitening agent was used periodically within the Invisalign aligners during the active phase of the process. The patient was thrilled with the ease of treatment and the dramatic results.  The Invisalign process is based upon Dr. Singer's computer generated model of the patient over time. Click below to see the brief film of the tooth movement. The first video shows the movement with "attachments". The second shows the treatment with the attachments removed. The patient continues to maintain the desired position of the teeth by wearing nearly invisable, and extremely durable Vivera Retainers (look very very closely at the next photo), another effective Invisalign product. This patient expressed his desire for a more attractive smile to Dr. Singer. His specific concerns included the midline space, broken down and stained teeth an uneven gum tissue. Anatomical measurements and models of the patient's bite were studied. Dr. Singer developed a treatment plan to appropriately meet the patient's needs in a Minimally Invasive way. The risks, benefits, alternative plans and costs were presented and discussed with the patient and the patient took the time to ask many questions. The excess gum tissue and bone were removed and excellent healing took place. The teeth were conservatively prepared for an impression and the patient leaves with stable and attractive temporary veneers. Dr. Singer works very closely with the dental labratory to fabricate final cemented veneers that will yeild and excellent result. The patient is extremely satisfied with his new smile. Through effective communication with Dr. Singer, the patient had appropriate expectations and a full understanding of the entire process.